POTTY TRAINING! Sounds scary doesn’t it? I have to admit, I started to get nervous as we got closer to starting. But there really is nothing to be scared or anxious about. The first week we read potty books and I even downloaded an Elmo Potty movie onto Izzy’s iPad. 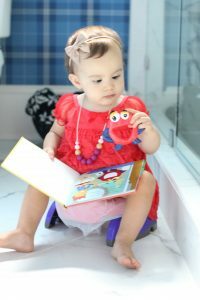 She LOVES Elmo so the Elmo book and movie were her favorite and I think most effective for talking about the potty and introducing the concept. 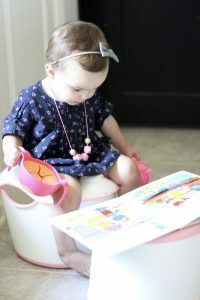 Try to find potty books with your kids favorite characters, it will keep them more engaged. The second week we continued with the books and movie but I added a mini potty to a bathroom downstairs and upstairs. So every time she came into the bathroom to have a bath, brush her teeth or watch me potty, haha parents you know what I am talking about, she was seeing her potty and becoming familiar with it. I even would put her on the potty and say, yay, “great sitting” or give her a high five. The third week we began her potty training. Remember every child is ready at different times because some may not physically be ready, being able to hold their bladder. Some kids may not be ready because they do not communicate well. Communication can be through sign, gestures or speech. Communication is needed for potty training. Day one we had a couple pees in the potty and by day 4 we even had a poop. Right now I’m teaching her the concept of the potty. This is where you sit and go pee or poop. Izzy really doesn’t like having her diaper changed, especially after a poop so I tell her, “If you poop on the potty then mommy doesn’t have to wipe as much.” Now that the potty is something she sees and is starting to grasp this isn’t an abstract concept for her when I tell her things like this. We are not pushing it and taking our time continuing to bring her often and cheer her on when she has a successful pee or poop on her potty. We keep the area tidy by putting her books, toys and pull ups or training pants in a basket near by. I know she is young being only 1 1/2 but our goal is to be trained by the time she is 2. I want this to be a stress free transition for the whole family so we are talking our time getting her use to the concept and praising the successes. Funniest potty training moment so far? Well we have two. 1. Izzy wore her travel potty around on her neck when we first pulled it out of the box. 2. Her first poop on the potty was so big my family thought there was no way it was hers when I sent them a picture. 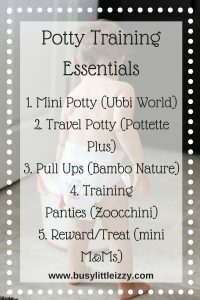 So what are our potty training essentials? We keep Izzy’s mini M&Ms in a container near by. 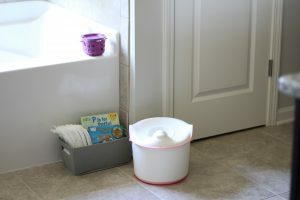 We always put her potty in a bathroom and keep a basket of books, toys and pull ups and/or training pants. 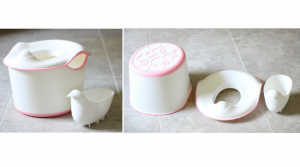 I love Izzy’s Ubbi potty because it also changes into a big potty seat cover and step stool (for down the road when she is bigger). Up to you, but I got one for upstairs and down so I’m not carrying a potty up and down the stairs. Izzy tried out her travel potty at her Nana and Grandad’s house. 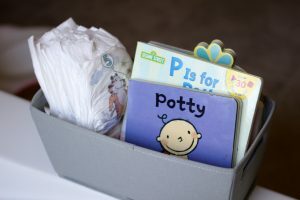 The adorable potty kit came with a toy and book. 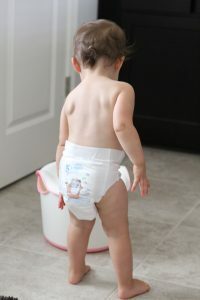 We have expressed our love for Bambo Nature Diapers already. Izzy still wears diapers to bed and in the car. While home she’s either naked, in training pants or training undies. Bambo Nature makes safe and eco friendly baby products such as diapers, training pants and wipes. I suggest some training pants from Bambo Nature because they are safe on your baby and they allow for some independence so your child can pull their pants down and back up. Also as I have said before these diapers and training pants are the SOFTEST Izzy has ever had! Ready for the next step? Zoocchini makes some adorable training pants and underwear. Seriously the animals and colors are so fun! The training pants are thicker in the bottom and front to help soak up some accidents. Good luck & remember, stay calm and it will be a calm experience. 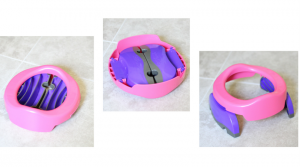 So many great potty training products available now!! You’re doing a great job Izzy!! I think I need to invest in a travel potty. I always get nervous my daughter won’t be able to hold it on longer car rides. 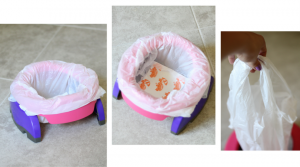 I will DEFINITELY need to come back to this post very soon when we potty train my daughter! thanks for sharing! Thank you! Pin it on Pinterest! 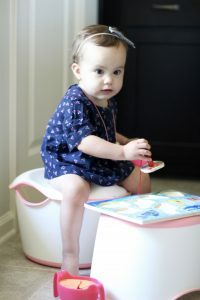 We have started to think about potty training now that Parker is almost 20 months. She does a little dance when she pees now. I need to get her one of these cute seats! I need to get a travel potty for Liam. We are always in the car so this would be very convenient! 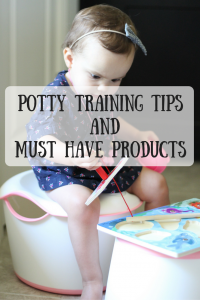 I will definitely need to keep these products in mind when our daughter is ready for potty training. Yes they are wonderful products! We don’t have kids yet, but this is still good to know for the future! Thanks for sharing! No problem, save it on your Pinterest for later ?